Woman member of the Exploration Party partnered by Ernest Favenc and Harry Alington Creaghe and accompanied by Lindsay Crawford. This article was put together by Michael Barnet, Emily Creaghe’s grandson from her second marriage. On various occasions references have appeared in the press regarding the exploration of country in the Northern Territory (then part of South Australia) in 1883 by Ernest Favenc and his partner Harry A. Creaghe, accompanied by Mrs. Creaghe and Lindsay Crawford. Some of the references were substantially correct while others were incorrect in many details. All however have been unanimous in referring to Mrs. Creaghe as the first woman to ever attempt such a trip into those hitherto unexplored regions, though little has been said or generally known of the details surrounding this remarkable feat by a young woman of 22 through the then wild unexplored country of the North. A diary of the eventful happenings on the trip was kept by Mrs. Creaghe containing a vivid account of the daily experiences on the trip. The achievement of this young woman member of the exploring party was the more remarkable in view of the fact that she previously had no experience of the hardships of the far outback or of long riding and had, as a girl, led a sheltered life of the Victorian era as the daughter of Major George Cayley Robinson, a retired Royal Artillery Officer in the British Army in India, who was a relative of the Marquis of Ripon (then Vice Roy of India) and was a cousin of Sir Hercules Robinson (a former Governor of N.S.W.) and of Sir William C.F. Robinson (Governor of Western Australia at the time of the writing of the diary in 1883). Emily Caroline Robinson, as she then was, married in December 1881 Harry Alington Creaghe (a grandson of the Marquis of Ormonde [Piers Archer-Butler, 1758-1827] and since then her life had been a full and eventful one. The exploration trip of 1883 was undertaken by Messrs. Favenc and Creaghe to report on the country for the South Australian Government and it involved some six months in the saddle through unexplored country among tribes of wild aborigines and often in dire straits through want of water and food. Despite the hardships encountered Mrs. Creaghe went through the ordeal and came out with flying colours. Mr. Creaghe died on 6th August 1886 leaving her a widow with two young children, Gerald Harry Creaghe and Harry Percy Archer-Butler Creaghe. She was married again in December 1889 to Joseph Jupp Smallman Barnett who was well known for many years as a manager of “Marlborough” and other cattle Stations near Rockhampton prior to his death in 1922. Mrs. Barnett spent 20 years at “Marlborough” before settling in Rockhampton while completing the education of her children and in 1899 was aboard S.S. “Perthshire” with five of her children when that vessel was adrift with a broken shaft for seven weeks in the Tasman Sea. She subsequently (in 1920) went with various members of her family to Sydney, where she continued to lead a remarkably active and useful life until her death on 11th November 1944 age 84. The diary its self can be found in the Library Section. I remember my Grandmother, Emily Caroline. She lived next door to us in Sydney, and died when I was 11 years old. When her husband Harry Alington Creaghe died, she married my grandfather Joseph Jupp Smallman Barnett. He also died before I was born. 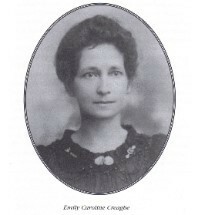 Emily Caroline told my mother when she married my father “I didn’t even look after my own children, so don’t expect me to look after yours.” Where she lived on a cattle property in Queensland of course, they had lots of paid help.